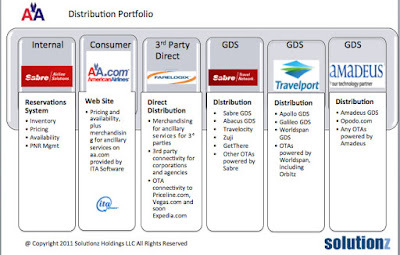 This is part 3 of 3 in the discussion about the distribution portfolio of American Airlines. In the previous two posts, we've looked at the internal CRS environment of the airline (which for AA is Sabre's Airline Solutions) and we've looked at the technology necessary on the consumer front to power the website and to do the merchandising that the CRS and GDS platforms are not currently capable of. In the second post, we also looked briefly at the role that Farelogix FLX platform plays in the 3rd party direct distribution efforts of the various airlines that are its customers. That includes AA. 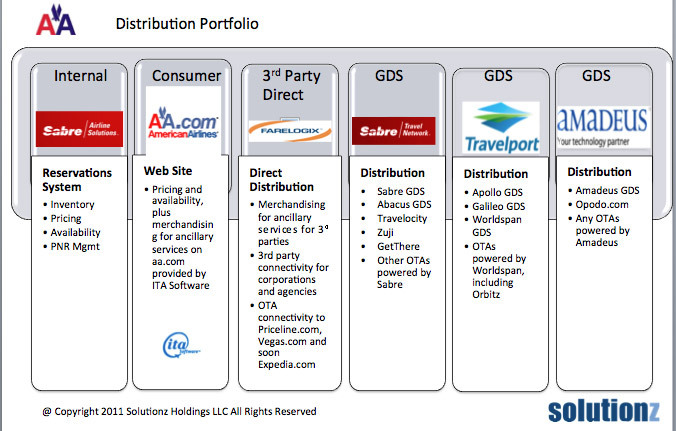 In this post, we look at the role that the GDS plays in distribution for the airlines. This is an oligopoly with three major players and one regional player. Travelport owns three GDS brands, Galileo marketed globally, Apollo and Worldspan marketed primarily in the US. Travelport is the number two player in the US. Sabre is number one in the US and markets its product everywhere in the world but Asia, where they have an investment in Abacus. Separate from Abacus's booking volume, Sabre is the number three GDS worldwide. Abacus is hosted on Sabre. Amadeus is the number one GDS worldwide, but is the number three player in the US. Collectively, the GDS companies reach over 60,000 IATA registered agencies with their global networks. I believe Amadeus serves the greatest number of countries, at 217. If any of you remember Jim Barlett, the CEO of Galileo before it was sold to Cendant, he used to talk about these as "points of presence". 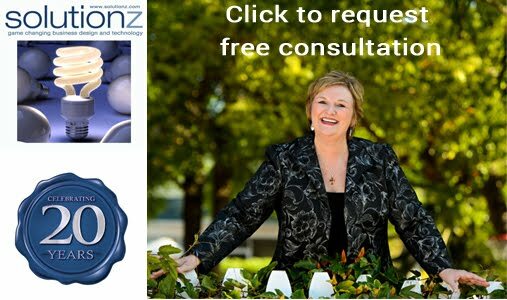 GDS contracts with agencies are multi-year and the terms vary greatly from agency to agency. Some large agencies have contracts with all three major GDSs, with one generally being the "primary". The relationship between an airline and a GDS is in the form of a Participating Carrier Agreement. This is what gets the airline's products "on the shelf" of the GDS display. And being on that shelf, gains the airline access to the customers of that particular "store". American currently has Participating Carrier Agreements with Travelport brands Apollo, Galileo and Worldspan, Sabre and Abacus (which is hosted in Sabre) and Amadeus. There are other regional distribution system companies in areas like China and the Middle East where they also participate, but this blog is focused on the main GDS companies. If you watched the "New Cookie" video produced for Open Axis, they actually see the GDS as the truck that delivers the product to the retailer, but in fact, the GDS actually takes care (in real time) of stocking the shelves and pricing the product for the retailer, with the prices filed by the airline with ATPCO. The GDS companies update nearly a million prices from ATPCO on any given day. While pricing comes from ATPCO, the availability for the various flights comes from a connection between the airline and the GDS. Airlines can opt for a low level of connectivity (akin to having to ask "do you have a seat" and waiting for the answer), or standard availability (where the flight is open for sale until the airline closes it and you get an immediate confirmation, all the way up to numeric availability which displays in real time) or higher levels of connectivity known as Direct Sell (similar to going to the shelf to see if the product is there and then returning a confirmation with the specific information about that "cookie", including a link to the airline PNR). American presently participates at the top level in all of the GDS systems, taking advantage of their highest level of connectivity (and paying a higher rate accordingly than those that participate at the lowest levels). To take the Open Axis analogy further, for an airline that charges for ancillary services, including seats and bags, the basic product today on the GDS stocked shelf is the basic "cookie", without any of the cream varieties that require refrigeration. That is to say that it is the basic right of passage on the plane with one bag and one carry on item, and in most cases these days, if you buy a ticket in coach that means that you can sit in any center seat that you wish. 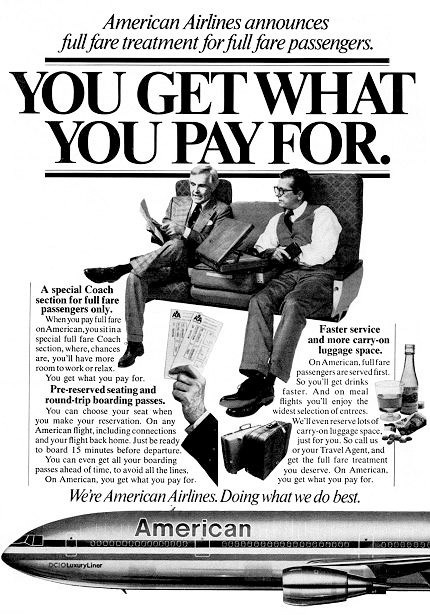 Those of us that have been in the business for a long time will remember the days when that exact same "cookie" included not only the right to sit anywhere (including an aisle or a window), but it included pillows and blankets, magazines to read inflight (beyond American Way and the SkyMall), reasonable seat pitch in coach, a hot meal and a salad with an olive! Movies were shown on flights over 2 hours and everyone got a headset. Oh, and to check a bag or two, you just had to tip the sky cap a buck a bag (or bring them in to the ticket counter to check if you were cheap or the lines were too long at the curb). Currently, the GDSs cannot sell American's ancillary services without first connecting to Farelogix FLX platform. Even then, there would be development work to integrate that into the "booking path", both in their "green screen" product and their browser-based agency platforms. The one thing I would like to say on that front is that there is some disagreement on whether the GDS can't (due to legacy nature of their platforms) or simply won't do this work. I will answer that with a simple tenet. You can do anything with the right amount of time and money and the GDSs have shown time and time again that if it makes sense to move a process off the mainframe, they will and they have. I will also add that when you have a taskmaster such as a Private Equity company or Wall Street, there better also be a return on investment (ROI) attached to taking on that work. That is still an open question, as no one is stepping up to pay for the "cream" or the refrigerator trucks to deliver it. 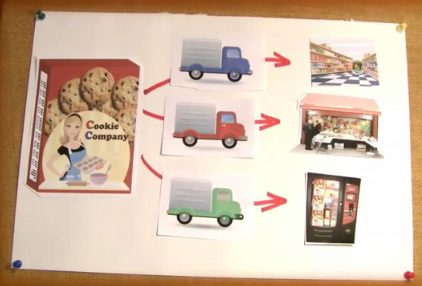 The interesting thing about the truck analogy is that since there isn't physical product, and the GDS is taking care of reaching the retail channel on the airline's behalf to sell their "cookies". The GDS pays for the truck, the maintenance, the fuel and the driver and the airline only pays (in the form of a segment based booking fee) if one of the retailers on the truck's route buys a cookie. Variable cost distribution. And if indeed the airline still pays the retailer to sell the cookie (in the form of a commission), that too is completely variable, as they don't pay if the agency doesn't sell their product. Lastly, the basic leverage of the GDS isn't just the points of presence that they have contracted, but it is the average yield on the sale of each cookie that makes this particular network so valuable. While each airline's numbers will vary from these, this is the first quarter set of numbers from the Airline Reporting Corporation, for all air tickets sold and settled through ARC. The premise here is that if the airlines are indeed matching the OTAs on price (which Kayak proves every day that they are), then the average airline ticket issued by a US carrier for a domestic and international "cookie" should be the same as the online number above. 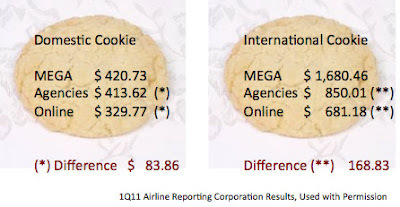 So even the basic agency in the US is yielding $83.86 more than the airline direct for the domestic "cookie" and for the international "cookie" is yielding $168.83 more. Now, I don't have a degree in economics, but I must be missing something in understanding why you would want to shift away from a channel that has this kind of differential in gross profit. If this is all about money, then shifting from an online agency to your own website (or taking the GDS out of the equation in that situation) makes sense. For someone like Priceline to switch how they access AA's inventory is not nearly as disruptive as it is for an agency, who has to integrate in with front office, mid-office and back office systems. But the brick and mortar agency community and the mega agency (which include Carlson, Amex, BCD, HRG, Maritz, Omega and SATO) yields seem to me to be adequate to cover the distribution costs, particularly since they are wholly variable. And the new technology required by the agencies is a much more complex implementation due to the level of integration required to their front office, mid-office and back office systems. There is that time and money issue again. I do know from talking to the key players that the presumption is that if the internal channel is a lower cost channel and you can move the business there, that theoretically you have saved money and everyone is better off (.....well, maybe not everyone). But if the average yield goes down, I'm not sure how you can make those economics work. If you didn't read my post on "looking through a single lens", then click on the image to the right. Now don't get me wrong. I am all for progress. And I happen to love what Farelogix has developed, both in its FLX and SPRK products. 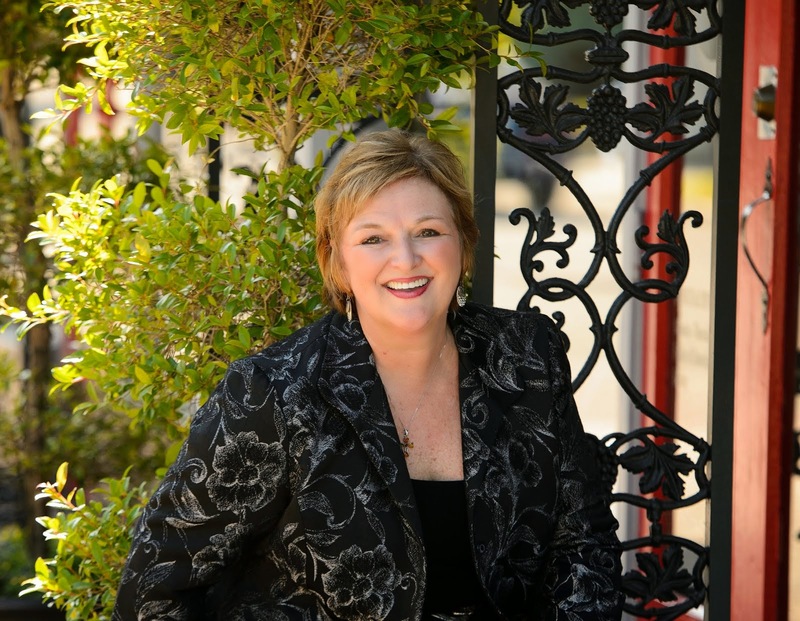 When the company was founded, I headed up their Advisory Board and worked with Sandler Capital and the Board on their long term strategy. I have a tremendous amount of respect for Jim Davidson and his team, as well as many of the technology companies that have developed interfaces to FLX. That is me speaking with my industry hat on. But from the consumer perspective, if I use a travel agent and I want a refrigerated cream filled cookie, I want that process to be smooth and easy and I want the travel agent to benefit from being in the middle of that transaction. What I don't want, is for them not only to have to add in a refrigerator case (at their own cost), but for there to be no compensation for them for that sale.